Religion • Information on the Internet scaring away some members, so faith plans to open up. 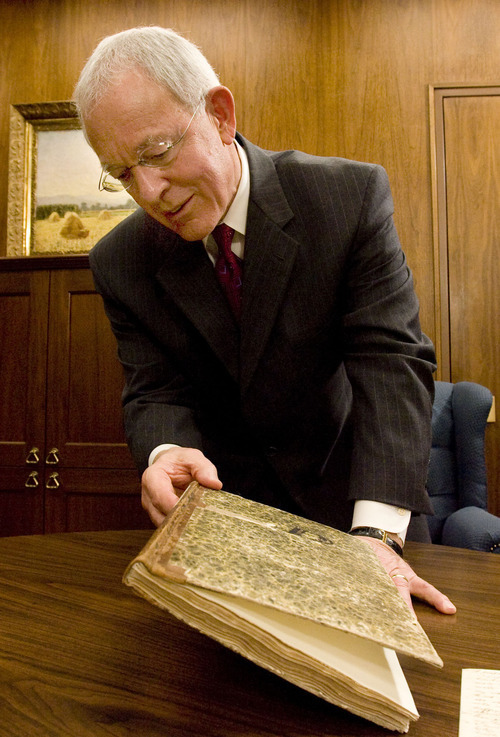 In his office in the LDS Church Office Building in Salt Lake City, Elder Marlin Jensen holds a journal that contains dictated and handwritten entries from Joseph Smith from 1835 and 1836. The journal is part of the LDS Church's Joseph Smith Papers Project. Jensen has been replaced as the church's historian. Monday, February 25, 2008. Steve Griffin/The Salt Lake Tribune 2/20/08 Elder Marlin Jensen of the LDS Church's First Quorum of Seventy has been replaced as the church's historian and will become an emeritus general authority in October 2012. He says the faith plans to arm its members with more information to confront "misinformation" on the Internet, especially about the church's history. An LDS student surfs the Internet for a school assignment and discovers that Mormon founder Joseph Smith had multiple wives, even marrying a 14-year-old. A returned LDS missionary, preparing a Sunday school lesson, comes across a website alleging that the Book of Mormon was plagiarized from a novel. Surprised by what they find so easily online, more and more members of the Utah-based Church of Jesus Christ of Latter-day Saints are encountering crises of faith. Some even leave the fold and, feeling betrayed, join the ranks of Mormon opponents. It's a growing problem, acknowledges LDS general authority Marlin Jensen, the faith's outgoing church historian, and one Mormon leaders are working to confront. "Never before have we had this information age, with social networking and bloggers publishing unvetted points of view," Jensen said in an interview Monday. "The church is concerned about misinformation and distorted information, but we are doing better and trying harder to get our story told in an accurate way." The church "has made no effort to hide or obscure its history," Jensen said, but some aspects  such as polygamy  "haven't been emphasized often because they were not necessarily germane to what is taught at present." Can the LDS Church do better to explain its history, even to its own members? Sure, Jensen said. "Can we weave some of this into our seminaries, institutes and adult curriculum? I think we can, and efforts are under way to do that." Late last year, the church's publishing arm, Deseret Book, put out No Weapon Shall Prosper: New Light on Sensitive Issues to address some of the hot-button issues of Mormon history and doctrine, offering members ways to answer critics. 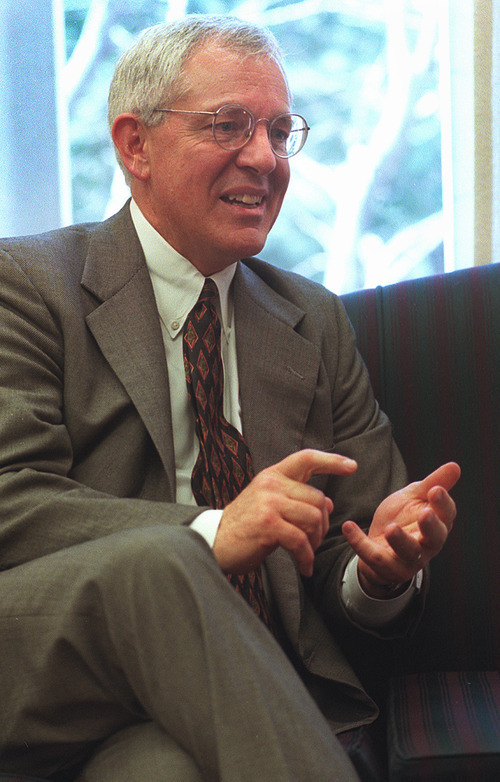 While Mormons should not be "consumed with provocative materials critical of the [LDS] Church, the day for ignoring such matters is long past," editor Robert Millet wrote in the book's introduction. "The Internet is filled with thousands of pages of anti-Mormon polemic, and it is extremely difficult for people to receive an honest and fair appraisal of Mormonism without significant effort on their part." Chapters are written by various authors  most of them professors at church-owned Brigham Young University  and tackle tough topics, including the Mormon view of God; the differing accounts of founder Joseph Smith's "First Vision"; Smith's money-digging activities and plural marriage to teenage girls; the lengthy quoting of biblical passages in the Book of Mormon; and new questions surrounding the faith's signature scripture from DNA analysis. Jensen insists critics overstate the LDS exodus over the church's history. "I have heard that our overall activity, especially in the United States, is as good as it's ever been," he said. "To say we are experiencing some Titanic-like wave of apostasy is inaccurate." Other Mormon observers, though, see such defections as a major trend, especially among 20-somethings. "I definitely get the sense that this is a real crisis," said Mormon scholar and writer Terryl Givens. "It is an epidemic." There is a "discrepancy between a church history that has been selectively rendered through the Church Education System and Sunday school manuals, and a less-flattering version universally accessible on the Internet," Givens wrote in an email from Virginia. "The problem is not so much the discovery of particular details that are deal breakers for the faithful; the problem is a loss of faith and trust in an institution that was less that forthcoming to begin with." Another issue is the "veneration for Smith and other leaders that imposes on them an idealized portrait of goodness and inerrancy out of all proportion to Smith's own self-understanding of his role," said Givens, a professor of literature and religion at the University of Richmond. "Biblical prophets like Moses and Jonah are depicted as accomplishing God's purposes in spite of personal flaws, misjudgments and downright bad choices." LDS scholar Richard Bushman, author of the critically acclaimed biography Joseph Smith: Rough Stone Rolling, has become a kind of historical therapist, he wrote in an email from his home in New York, "counseling with distraught wives and parents or disaffected Mormons themselves." For those who discover unwelcome information about the church's history online, Bushman said, "the whole picture changes in a flash  like those optical illusions that show a beautiful woman and a hag." The best way to prevent this from happening, Bushman said, is to give Mormons "the whole story from the beginning. If the disruptive facts are worked into the history Latter-day Saints learn as they grow up, they won't be turned upside down when they come across something negative." But when Latter-Day Saints find out about that on the Internet at age 50, he said, they'll ask, "Why didn't the church tell me?" By then, Givens said, you may have lost them. In a nonscientific online survey last fall, researchers at the Open Stories Foundation found that 81 percent cited loss of faith in Mormon founder Joseph Smith as a moderate or strong factor in their no longer believing in the LDS Church. Another 84 percent said they studied LDS history and lost their faith. About 79 percent lost faith in Mormonism's founding scripture, the Book of Mormon. The survey, which was posted on various LDS-related blogs and websites as well as Facebook, attracted more than 3,000 self-selected, nonrepresentative responses. It found that the two historical issues that most negatively affected belief in the faith were "the Book of Abraham"  a Mormon text that Smith said was based on Egyptian papyri he obtained  and polygamy, which the church abandoned in 1890.